Reducing hospital readmissions has become increasingly important within the healthcare industry, and Partners in Healthcare takes the task of helping health systems reduce unnecessary rehospitalizations very seriously. Because of regular interaction with patients, our specially trained staff of RN managed caregivers are often the first to recognize potential health issues such as changes in fluid intake or output, swollen ankles or labored breathing, and will take action quickly before these issues lead to a hospital readmission. 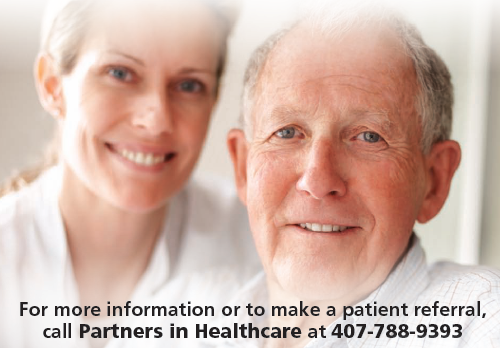 Partners in Healthcare is a private duty licensed and accredited Home Health Agency. We help medical practices improve their client compliance via ongoing communication of client status with your office and thereby reducing hospitalization risks. Our services include basic homemaker and personal care with oversight provided by RNs. We also offer services like medication management, access to ancillary medical services as well as other nursing services, which are not covered by acute care insurance such as Medicare, Blue Cross, Cigna or Humana. We are experienced in knowing when and how to access those covered services when appropriate. These are the ways we can benefit your team first we cover where Medicare won’t, with a comprehensive on site assessment which is done by a RN who develops a client centered care plan focusing on their specific needs. Second, we provide ongoing timely communication between our staff and yours regarding medication, complications and status changes facilitating prevention of a rehospitalization. All of these things will help with patient/family compliance of your medical treatment plan. Hospital to Home Smooth Transitions: Patients are at their most vulnerable when transitioning from hospital to home. Partners in Healthcare can be there every step of the way for patients, providing transportation and support to ensure comfort and safety and build patient confidence in managing care at home. Improved Care Plan Compliance: We work with patients and their care teams to improve education and communication and enhance the continuity of care so patients are more successful in following a prescribed plan of care. Disease Management Education: Partners in Healthcare has an extensive supply of disease-specific educational materials targeted to help patients and their families better understand their specific diagnosis and care requirements. Through education, our caregiving team encourages family involvement in care, helping them to better understand the condition and monitoring of the disease. Plan Review: Partners in Healthcare provides an initial RN assessment followed by a periodic review of the patient’s health and functional status to ensure quality care. Care Coordination and Timely Reporting: Our team works seamlessly with all healthcare providers and family members, providing ongoing, timely reporting regarding changes in health status. Medication Management: Partners in Healthcare helps to ensure medication collaboration among healthcare providers and the patient. Our caregivers ensure that medication is taken as prescribed, can pick up refills and are trained to recognize and report adverse side effects that could lead to complications. Provide Diet-Specific, Nourishing Meals: Healthy, nutritious and diet-specific meals play a large part in patient health. We plan and prepare meals as well as educate our clients on making healthy food choices. 24-Hour Response System: Research has reported that on-call coverage improves care and patient satisfaction. Our patients have the comfort of knowing someone will be reachable during an emergency or to handle their care questions. Click the following button for a summary of the benefits of discharging patients to Partners in Healthcare reducing readmits.